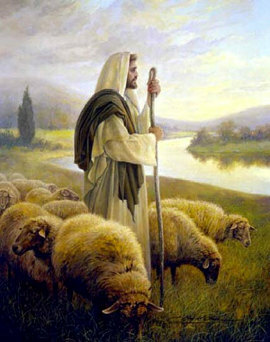 The sheep listen to the voice of the shepherd. WHEN I SEE a flock of sheep I see exactly that, a flock. A rabble of wool. A herd of hooves. I don’t see a sheep. I see sheep. All alike. None different. That’s what I see. But not so with the shepherd. To him every sheep is different. And every sheep has a name. The one with the sad eyes, that’s Droopy. And the fellow with one ear up and the other down, I call him Oscar. he’s an orphan with no brothers. I call him Joseph. When we see a crowd, we see exactly that, a crowd. Filling a stadium or flooding a mall. When we see a crowd, we see people, not persons, but people. A herd of humans. A flock of faces. That’s what we see. But not so with the Shepherd. To him every face is different. The one with the sad eyes, that’s Sally. The old fellow with one eyebrow up and the other down, Harry’s his name. And the young one with the limp? He’s an orphan with no brothers. I call him Joey. He knows each one by name. He knows your name. And he will never forget it. Quite a thought, isn’t it? Your name on God’s hand. Your name on God’s lips. Maybe you’ve seen your name in some special places. On an award or diploma or walnut door. —a coach, a celebrity, a teacher. But to think that your name is on God’s hand and on God’s lips . . .
my ... could it be? Or perhaps you’ve never seen your name honored. And you can’t remember when you heard it spoken with kindness. If so, it may be more difficult for you to believe that God knows your name. but the name he has in store for you. A new name he will give you . . . These are the primal questions of the soul. And if left unanswered, such questions steal our rest. Only one other living creature has as much trouble resting as we do. Not dogs…they doze. Cats invented the catnap. Most animals know how to rest—with one exception. These creatures are woolly, simpleminded, and slow. For them to do so everything must be just right. No tension in the flock…no hunger in the belly…everything has to be just so. Unfortunately sheep cannot find safe pasture or find food. They need help. They need a shepherd to lead them, and help them to lie down in green pastures. Without a shepherd they can’t rest. Without a Shepherd, neither can we!